The Church now meets in what was known as Broadlane Primitive Methodist Church, and in 2013 celebrated its 10th anniversary at the chapel (though GCC has been going much longer). It must be remembered during the period being described, that Redruth and Illogan (which as a parish stretched from Godrevy and Porthtowan to Forest on the far side of Four Lanes), was a mixture of rural and industrial. 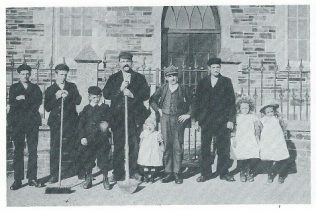 Redruth was like a Wild West town, lawless with poor and deprived people. Half the town we know today was mines, and work was not consistent, with mines failing or closing due to tin prices. Yet there were good works and Churches built (not just Methodist but C of E also) along with schools and hospitals and the dreaded Work House. It was a hard life for many. The people mentioned here are the named ‘middle’ people who were able to ensure the promotion of the Word in the area and had the connections, but the congregations were made up of many who had hard lives (husband and wife and children all sometimes worked) and gave their time and talents to build and populate these places. Through these places they also gained not only a faith but an education (reading writing music etc). 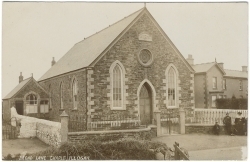 Until the rise of Methodists, the only Church in the Illogan parish was C of E.
One family was the TANGYES (Joseph and Anne 6 boys 3 girls) who occupied land opposite and around the now chapel. Mr Joseph TANGYE was fined on several occasions for not attending the Parish Church, having instead walked the 2 miles into Redruth, to attend Quaker meetings. We launched the Great Eastern and she launched us. One of the boys, Sir Richard, became a local JP and MP. He gave £50 to the building of the present chapel. (He was also the great-uncle of film maker Sir David Lean). They attended the Lady Bassett School (still standing behind Trevenson Church and is the original Pool School!) before leaving Cornwall for further education. Also in 1740’s Methodists began to creep into Cornwall. 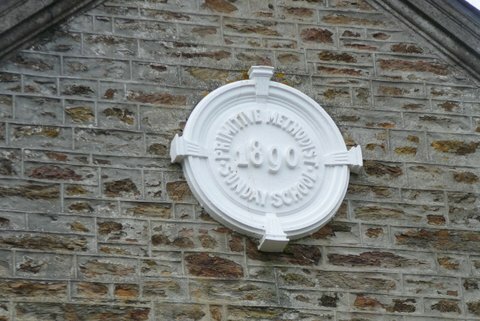 The first Methodist societies in our area started at Tuckingmill, Bridge and Carnkie (Redruth). The Cornish population doubled between 1750 and 1850 due to mining, and there were several revivals (1764, 1782, 1799, 1814 and 1832) The Illogan Parish Church even agreed service times so that people could attend both the Parish Church and the Methodist meetings. There were weekly class meetings at Roscroggan, Tolvaddon Downs, Illogan Downs, Lower Melrose, Pool, ,Blowinghouse/Grenifer (in the valley behind us…and the base of the meeting house remains built next to the old stream works), Condurrow, Pengegon and Illogan Highway. Many meetings were in private houses or roughly built buildings. One such building was up the road from our chapel. You will remember it as Balls Feed Store, where the new houses at Mill Grist Meadow stand. This was Ebenezer (1839 a daughter chapel of the Bridge/Illogan Downs/Vougebeloth society). Famous of the Bridge society was Thomas GARLAND (b1771) who worked between Illogan and Porthtowan. The Primitive Methodists arrived in Oct 1825 and sought to revive the original Methodist aims. The Methodists had split in to various groups in the 1840’s and our area included Bible Christians also. A local leader TURNER invited a founder of the Primitives, William CLOWES, who preached locally (though strangely no one invited him home for a meal after one service and he sat on top of Carn Brea eating berries. Strangely his must have been at home as the hill is similar to the Mow Cop in Staffordshire where Primitive Methodists often met). His visit increased Methodist members in Illogan from 100 to 250 in just a few weeks. The Primitives expanded in the area at Tolgus, Blowinghouse, Illogan Highway, Carnkie and Broadlane. 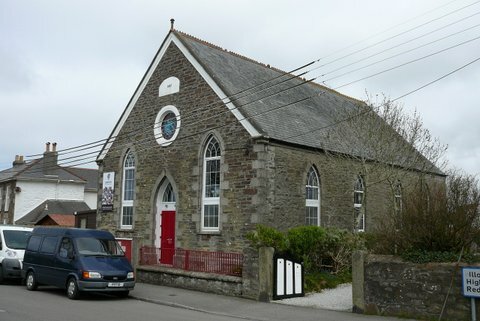 An attempt was made to build a chapel in the Broad Lane area in 1840, when £10 was paid to a builder and attempt made to obtain the Illogan Reformers Chapel. Permission was granted in 1856 to build the first Primitive Chapel. In 1859 the Broadlane society built the first chapel for £58 13s 4 1/2d and had a debt of £32 2s 7 1/2d, and the lease of the land was held for the Cornish lease of 3 lifetimes and is possibly of wood and stone construction but I do not have those details. It was situated where the old Sunday School of 1890, now stands. 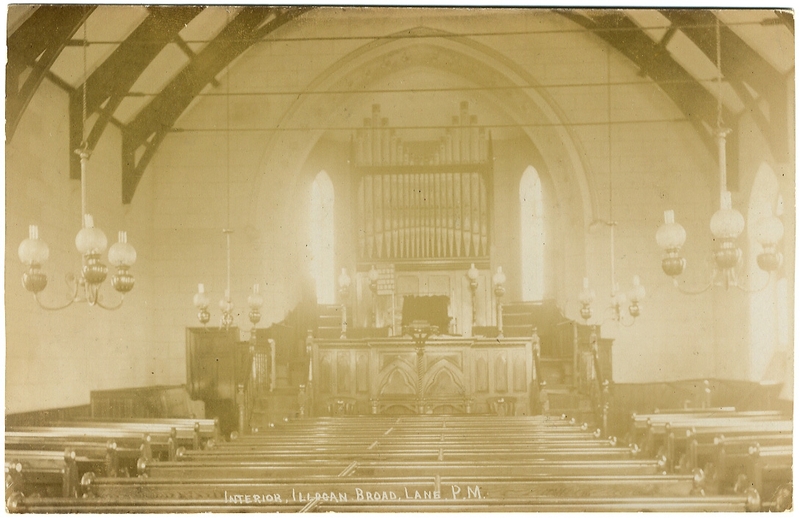 Between 1859 and 1866, various improvements were made, with new flooring, pews (for up to 130 people) and windows. This chapel was known local as LITTLE SUMP CHAPEL. This original building was demolished in 1889 to allow the building of the new Sunday School. The Sunday School Tea Treats, went out via an archway (I think the adjacent bridge for the GWR Portreath branch line) to fields now occupied by bungalows. A new chapel was built in 1887 and the school room across the road in 1890 on the site of the first chapel. It was 45 x 36 feet. The architect was Mr Whetter, and builder Mr (later Sir) Arthur Carkeek of Redruth. The granite edging came from Portreath (a small but important port a mile or so away) and the rest of the stone from West Tolgus (an area adjacent to the chapel). The memorial stones were laid on 18th May 1887, with the Sunday School children placing gifts on top (as was the tradition to gather gifts towards the building fund locally). One stone (and we do not know which one) is hollow and contains time capsule items inside. A lunch was held at the price of 1/- 6d (the whole lunch containing 20lbs of beef, 1 ham, 2 tongues,2 fowels,16 bottles of pickles and 10lbs of cheeses). Later a Tea was held at a cost of 1/- for males, 9d for women and 6d for children. A Harmonium was bought and John Harris employed as organist for £3 a year. The chapel finally opened on 9th November 1887. It was enlarged in 1891 (another history puts it as 1893) with the back wall pushed back 16 feet and vestry added. In 1905 alterations occurred again, when the organ from the original Plain an Gwarry (Redruth) chapel was bought for £100. In 2013, with renovations being done to the rear of the chapel, we found that the curved back of the chapel (built to accommodate the organ) sat on the back boundary wall, and large slabs of granite placed between the chapel and on the wall to hold up the organ. The organ is long gone, but the home spun building still exists. The membership in 1894 was 151 but congregation 330! In 1895 the freehold of the two sites was obtained from Lord Robert of Tehidy. The chapel was often short of money, and had various ways of fund raising. This included each member given a bag to fill with coins, one for each year of life. They also sold on items, including a lamp. Pew charges ( 1897) were 9d for main pews per quarter, with sides at 6d and others free dependent where they were. Despite being short of money they did hire an organist at £1/10/o a year. They also bought sixty two (62) Umbrella stands in 1906, fitted gas lighting in 1912 and electric in 1929. They also challenged others, with one story from 1889 with two drunks who disturbed the service being told to pay 10/- to the Redruth Miners Hospital, or get summonsed to the Magistrates Court. This is an offence under Ecclesiastical Courts Jurisdiction Act 1860 (persons found guilty of making a disturbance in churches, chapels, churchyards, or burial grounds.). I have used this legislation myself. The offenders paid up. 1. 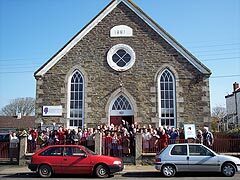 Thomas Merritt……the composer (celebrated every year with carols outside his home just up towards Treloweth School and grave at Illogan Parish Church)….baptised in the old Broad Lane Primitive Methodist Chapel in 1859, which later became Broadlane Methodist Chapel. (I think it was when the Primitives Bible Christian lot etc. got back as one denomination.) …the fore runner of our present Grapevine chapel. He composed carols which are still sung by the Cornish worldwide, hymns and organ music. He also composed a march that was played at the coronation of King Edward 7th. He was organist at the nearby Chili Road and Illogan Highway Methodist Chapels. TANGYE …as explained earlier. TANGYE Brothers of Birmingham. William TEAUGE from the famous mine engineering family (He died 28/11/12) wife MA TEAUGE died 21/3/05 at 99 years old! Think they are buried in Trevenson Church Yard. TEAGES exists still. It was an ANNE TEAUGE from the same family who married Trevithick Snr…….and became mother to Richard Trevithick. Capt. John DADDOW was a mine agent, and Capt. William RAMBLING possibly also a Mine Agent. I have found nothing, other mentions as being mine captains, and active supporting other chapels. William HARRIS was a leader and Harmonium player. His eldest son (also William) would not attend services unless he had first spent time privately with God. To him the whole world was his Father’s house and it was not unusual for him to tie up his horse and hop into a field to pray! John , his brother, was also a harmoniumist, choir leader, local preacher and circuit chancellor. Niece Miss E M HARRIS followed and was circuit steward. It would seem that they and others, broke the yoke of the official church, and gave to promote the word in many areas including Illogan. As we know the Sunday school is across the way and now being converted to a house. In recent history, the chapel closed in the 1990’s, opening once for a wedding. 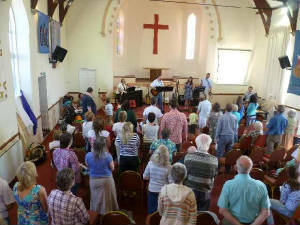 In 2000/2001 a group from the Redruth Apostolic Church took over the chapel with the aim of re-establishing their congregation, and for a time Redruth Baptist Church supported them, opening for coffee and even had thoughts of church planting. It was obvious God would not let this place go and knew the need for a congregation to be here. It was then that RAC and RBC approached Grapevine Community Church, which was meeting in a local school, and GCC took on the chapel, and Gods work continues unbroken. At Easter 2013, Grapevine celebrated 10 years of being at Broadlane, and we give thanks not only for all those who in the past worked hard to establish the chapel, but kept Gods presence in the area. In 2015, it will be 155 years of existence for the site as a chapel and Gods work. The whole story can be found in Thomas Shaw’s books, A History of Cornish Methodism, Methodism in Illogan, and Methodist guide to Cornwall; as well as J.C.C. Probert’s Primitive Methodism in Cornwall. We are truly delighted to see these pictures of Grapevine Community Church on this website. We value and appreciate the Primitive Methodist history of this chapel and the communities of worshippers who were there before us. Thank you for your prayers and vision. We would be most grateful to receive any information and photographs which enable us to describe and celebrate this rich history. Please do let us know at: gccoffice@btinternet.com or drop in and say hello! The second picture is certainly of a church which is thriving with God’s blessing. For those interested here is our web page: http://www.grapevinecommunitychurch.org/ If you attended the chapel in the past or have an interest in the history of Illogan churches feel free to drop in – perhaps share a coffee and a chat on a Friday morning, you are sure to be welcomed with a smile! Its a project on going so we would love to hear from anyone with information. As Wendy has said, its a thriving chapel. Having closed in the 1990’s, the local Apostolic congregation took it on with support from Redruth Baptist Church, before passing to Grapevine Community Church. The original chapel (which was wood) opened in 1859, and the present chapel followed in 1887 and extended shortly afterwards. Famous persons connected are Richard TANGYE (of TANGYE Bros. Engineers) and Thomas MERRITT (Composer). I believe the site celebrates 155 years in 2014. William Harris is my great, great grandfather and I’d love to learn more about this church, and his role. I’ve been trying to track down a copy of Methodism in Illogan with no luck. I’m wondering if you know where I could buy a copy (I’ve tried the obvious places, including the book seller associated with this site)? Or if you could provide me with a transcription of what is said about William Harris and family. His daughter Mary (Minnie) Harris moved to Grass Valley, California and was big in the Methodist church there. Further information from JCC Proberts book and others,shows that the size of the original chapel was 45×36 feet, and in 1891 extended by 16 feet. Further expansion was in 1905 when the back wall was pushed back and the organ from the old Plain an Gwarry chapel was purchased for £100. This back wall sits on an adjoining boundry wall (with modern housing behind) and there are large blocks of granite from the back wall to the new wall (still in place) on which the organ sat. Recent works in 2015 in the old boiler room show the wall lined with bricks from St Day brick works, and stamped as such and yellow in colour. Tea Treats were held on the fields now under bungalows on Clifton Rd. Services (timed to avaoid clashes with the Parish church and fines from the wardens) 2.30 pm and 6pm (with prayer service after the evening service). Of names mentioned in the original article, would seem that Capt HOSKING was a mine Captain and mineral agent for Tehidy minerals, and Capt BISHOP was a local mine captain for East Pool and Wheal Grenville as well as being a local preacher. They, and Capt DADDOW, were leaders locally and appear on the deeds and records of numerous societies and chapels In the area. The lease for the land on which new chapel and the Sunday School sat (under which the original chapel sat) were obtained from Lord ROBERTS in 1895, making them independent. Excellent work well done. Much of this information can be found in Rev Thomas Shaw’s book on Methodism in Illogan. 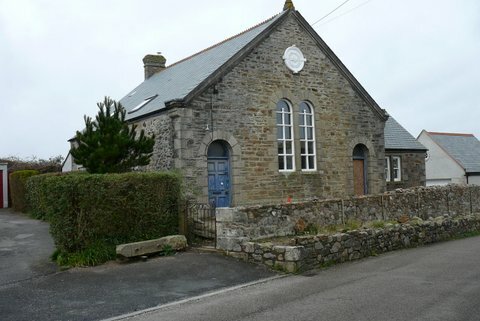 St. Ives Primitive Methodist Chapel, Cornwall.